* We have updated our page explaining the key reversal levels with a lot of new info and details for the different strategy numbers as found in the last column of the daily key tables. This should make it easier to understand and follow this approach. I hope to add more detail in the future, the page remains a work in progress. * For those who wonder what’s the point of these tables. Well, among other things it offers an objective take on the market. And that can be very useful, for example when market sentiment differs noticeably from what the key reversal levels tell us. For example, in an early February blog post I observed how the media had become very negative about emerging markets, yet my weekly key reversal levels were starting to give buy signals for countries like Indonesia. A few weeks later there was a buy signal for India. If you bought on the next Monday you now sit on profits of 8 and 19% respectively. The system doesn’t always win, but the losses are usually small versus the profits. That’s always the main feature of a good trend following system. The small losses you take are the entrance fee you pay to get in on the big trending moves. * Back to the key tables for this week. Weekly MoM is turning down for the DAX, so we have more markets that go into hesitating mode. Daily MoM has turned down for most stock indexes, but it is now turning back up for the Nasdaq. On outlier? Or will the other indexes follow the Nasdaq to the upside? We will find out soon. * In other world markets weekly MoM is turning down for Brazil, France, India and Italy. That’s a warning sign, especially for India where MoM has reached a very high +9 reading. * Bonds (TLT) are still looking for direction. * Gold is taking a pause after its recent jump. It is holding up well so far, but will need another push higher to confirm that a new up trend is in place. Daily MoM has turned down for gold, so it could see a retest of the $1290 breakout level before possibly heading higher. * The Euro is going into daily bullish mode. I have been warning that Euro could surprise to the upside. 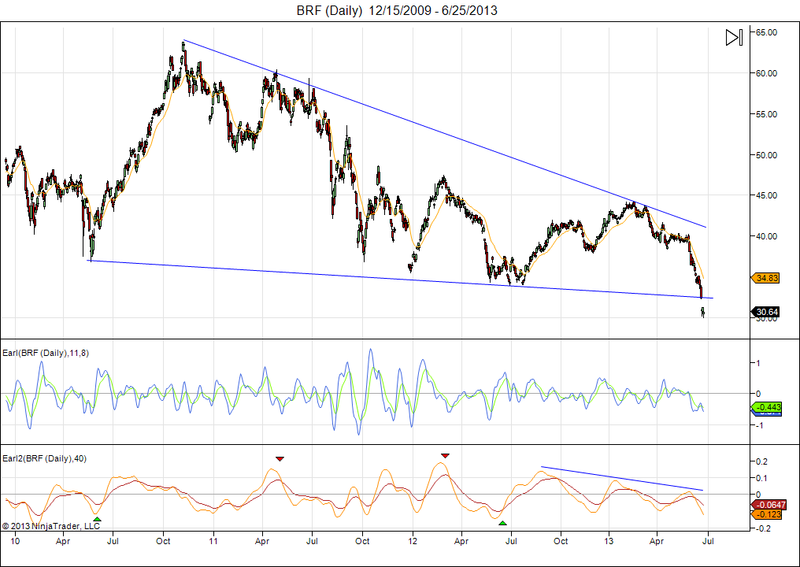 If it gets back above 1.38 then a short covering rally could quickly take it higher and turn the Euro fully bullish. 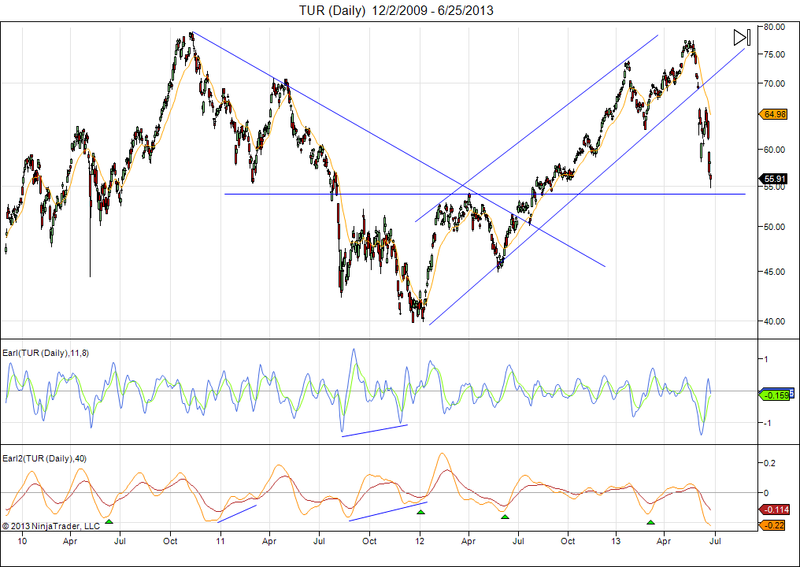 It is that scenario that is probably pressuring European stocks for the moment. * Oil is also pausing, but still bullish according to the key levels. * Our weekly key reversal levels for the 30 Dow stocks are available here. 25 stocks are bullish this week, down from 26 last week. Above 20 is healthy, see : Keeping an eye on the Dow stocks. * Nice drops in the Nasdaq and S&P 500 this week. This is the correction we have been warning for since the middle of March. US markets are now testing their weekly key reversal levels. Next week we will probably know if the Nasdaq and S&P manage to stay bullish or join the Nikkei and the FTSE100 by going bearish on the weekly level. * The five major indexes have downside weekly MoM again, so the risk that more markets will turn bearish is considerable right now. On the daily level these markets are in declining mode with downward momentum (MoM). We can expect tradeable bottoms as soon as MoM turns back up for them, especially for the markets that have not fallen below their weekly key reversal levels ( Nasdaq, S&P 500, DAX). Check out my daily key reversal tweets to see when MoM goes back up. * That being said, I would like to keep things in perspective by pointing to our weekly key reversal levels for other world markets, posted on twitter every weekend. Notice how most world markets remain dark green (strong bullish), with China and Hong Kong also turning green this week. So, this does not look like the start of a global bear market. What seems to be going on is a global portfolio rebalancing. Money that has flown into the US since the start of the year, for various reasons, is now flowing back into international markets. 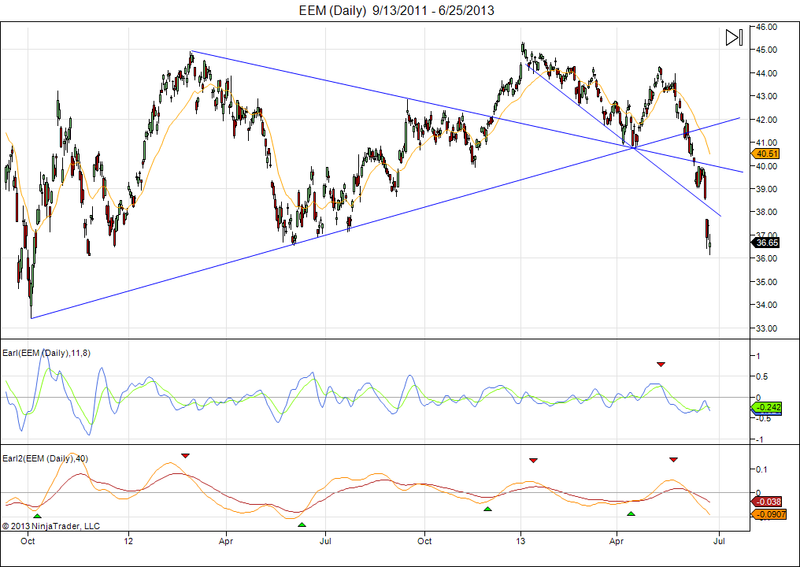 I already mentioned a few months ago that emerging markets looked good in my screens. Meanwhile, since turning bullish in our weekly key levels, markets like India and Indonesia are up 7% in 6 and 9 weeks respectively. Singapore is up 2% in 5 weeks. Even Brazil, Turkey, and South Korea, which turned bullish just last week, have been going up in the face of a sharply declining US market. And Euro-tortured Italy is up nearly 12% since turning bullish 15 weeks ago. * Bonds and Oil are the strongest markets right now, with gold and $EURUSD continuing to hang in the balance. I continue to watch the Euro carefully, as it is set to chose a direction sooner or later. A weekly close above 1.40 or below 1.3630 is likely to become a game changer for many connected markets. * Several markets are hitting our Top or Bottom targets, so watch these levels for possible trend reversals. Namely: 3975 for the Nasdaq, 13860 for the Nikkei, 111.80 for bonds (TLT), 104 for crude oil (CL). * The weekly key reversal levels for the 30 Dow stocks are available here. 20 stocks are bullish this week, down from 23 last week. Above 20 is healthy, see : Keeping an eye on the Dow stocks. Some readers have been asking for my key reversal levels for other markets and indexes. Here they are for a selection of countries. Read my earlier posts to understand how to use these tables, see here.